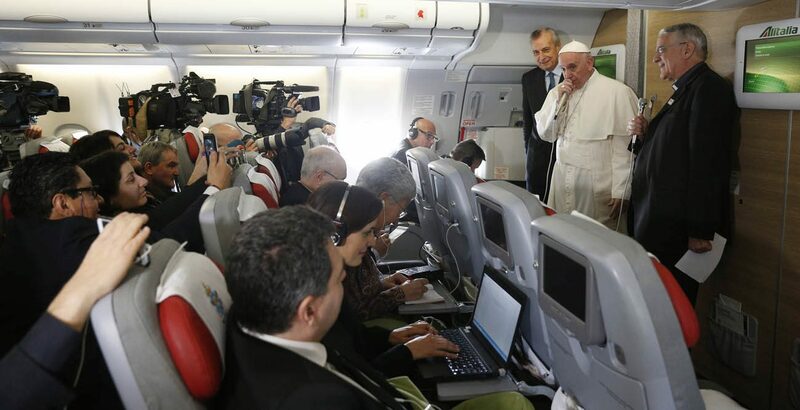 VATICAN CITY (CNS) — Journalists must meticulously uphold their craft of responsible reporting and not be tempted into partisan or ideological warfare, Pope Francis said. “Today, in a world where everything is fast, it is ever more urgent to call upon the tough and strenuous rule of exhaustive research, exchange and, if necessary, also keep quiet rather than harm a person or group of people or delegitimize an event,” he said. “I know it’s hard, but a life story is understood at the end, and this should help us become courageous and prophetic,” the pope told a delegation promoting integrity in journalism June 4. The delegation, led by Simona Agnes, represented the foundation and jury that award the Biagio Agnes Prize. The prize is named after the late Italian journalist and former general director of Italy’s state broadcasting network, RAI. Biagio Agnes’ brother, Mario, was a journalist for the Catholic press and headed the Vatican newspaper, L’Osservatore Romano, from 1984 to 2007. Biago Agnes served the public by seeking to guarantee information that was “correct, credible, authentic and timely,” the pope said. “In fact, being a journalist has to do with the formation of people, of their vision of the world and their attitude toward events,” he said. This “demanding work” is undergoing profound changes, he said, not only with digital platforms, but also in the way media is produced, presented and communicated. “It is hard to enter into that process of transformation, but it is increasingly necessary if we want to continue to be educators of the new generations” and offer depth, wisdom and love without getting drowned out in the din of so much information, he said. “It’s necessary to be very demanding of oneself so as not to fall into the trap of the logic of conflict because of special interests or ideologies,” he said. Pope Francis called on journalists always to offer a sense of hope and meaning to their reporting, even when needing to denounce “situations of degradation and desperation,” and to not ignore “the peripheries,” where there are stories of suffering and great solidarity.